If there were an epicenter for a fascination with the Nobel Prize, The Rockefeller University, with 24 such awards, would be it. For its size, the university has the greatest density of Nobel prizes of any place in the world. The big-picture factors that have led to such a prestigious legacy are ones best left to historians to debate. As a graduate student, I have two much simpler questions: what was each prize for and how were the essential discoveries made? In this series, we’ll peel back the arcane language and suspend a bit of hindsight to explore concisely the ideas and experiments that underlie each of the university’s 24 associated Nobel prizes. From the obvious “why didn’t I think of that?” to “that can’t be true” courageous nonconformity, we’ll look into the context of the problems solved and their greater importance. For if genius really is “seeing what everyone else has seen and thinking what no one else has thought,” I wonder what truths of the scientific process can be wrought by studying examples of genius close at hand. This isn’t to say that getting a call (or telegram) from Stockholm at five in the morning is the ultimate imprimatur of genius, but, as examples of what one university has accomplished over the past century, they’ll do just fine. So let’s begin. We’ll start our journey with something so fundamental, that we rarely give it a passing thought: plumbing. Any organism with a circulatory system, by definition, is filled with plumbing. The human body is a veritable city of blood pipes: around 60,000 miles of vessels ferry close to 5 liters of blood, all thanks to a large and reliable heart pump. These basic components of human anatomy (of existence even), work tirelessly in the background, ignored only until something goes wrong. For a surgeon over a century ago, such failures of circulation were frustrating things to encounter. Unlike the plumbing in an actual city, where a team of welders could quickly repair a ruptured water main, there was little a surgeon could do to solve the same problem in a person rapidly losing blood. Where was the surgeon’s welding torch? 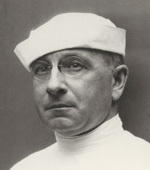 Alexis Carrel, a French experimental surgeon and the first of the university’s Nobel Prize winners, answered this call by inventing many surgical techniques used to repair blood vessels. As anesthesia and aseptic practices became widely adopted in the operating room by the early 20th century, such experimental surgery became possible, and Carrel devised cleverly simple and incredibly powerful methods that unarguably helped lay the foundation for modern organ transplantation. His basic question boiled down to this: how do I join two delicate and floppy tubes end-to-end? Many before Carrel had tackled this problem, using bits of bone or metal as rigid scaffolds for crudely sewing two blood vessels together, but complications like infection, hemorrhage, and bruising were constant problems. Carrel’s solution first required an initial detour. He left the operating room entirely and learned to sew from those who knew best: French embroiderers. Apocryphally, some say Carrel had learned embroidery from his mother in his boyhood, while others write merely that he studied under the finest embroiderers in France. What mattered was that he became so good at embroidery that his stiches across sheets of paper were fine enough to be invisible on both sides. Returning to the operating room, he perfected what is now known as Carrel’s triangulation technique for joining blood vessels together. No fancy devices were needed other than silk thread, fine embroidery needles and lots of skill, though the basic premise is ingeniously simple. Three stitches are placed at equal points around the circumference of a vessel to be joined. By pulling at these stiches, the vessel opening no longer resembles a floppy circle but a rigid triangle. Holding two such triangulated vessels end-to-end, it becomes easy to sew across the seam for a blood-tight seal (see below). Since no forceps are used to hold the edges of a blood vessel, only light and delicate silk thread, all sorts of complications were greatly reduced. Varying this basic technique, end-to-end anastomosis, Carrel performed veritable miracles of medicine. He could repair vessels of virtually any visible size (as small as “matchsticks” as one observer put it) and attach them to other vessels in all manner of ways, from junctions to loops. He devised means to repair blood vessels without exposing them to infectious agents, worked out ways to viably preserve tissues outside the body, and performed some of the first successful organ and limb transplants in animals. But Carrel’s visionary work was a full half-century before its time for wider use in humans, as he lacked antibiotics to control infection and the drugs to suppress the immune system. His lab closed upon his retirement in 1939, but the dream of transplant surgery certainly did not. As his 1912 Nobel can attest, Carrel demonstrated that the surgical part of transplantation and tissue repair was both possible and practical. Incidentally, Carrel’s lab was located on the 6th floor of Founder’s Hall, where the gym stands today. What a sight to imagine there: a surgeon hard at work in 1912, saving a dog or a patient, carefully suturing blood vessels, aiming to forestall certain death. I doubt any have sweat more than Carrel did in that space. This entry was posted in Campus Life, Science and Society by Nicolas Renier. Bookmark the permalink.